Mixed Media « She just can't sit still! About a week and a half ago I found myself inbetween fiber projects. I wanted something quick and fun to do and none of my current projects were fitting the bill. 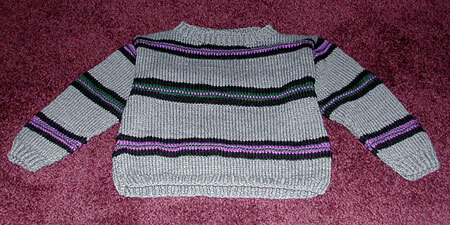 I also had a lot of yarn left over from the afgan project that I waqnted to use up in something. So I decided that grandson Christopher needed a sweater. I pulled out the scrap yarn I had and made a call to his mother for measurements then got to work. I used a simple pattern from a 1987 Vogue Knitting (it had dinasaurs on it, symptoms I wanted stripes, buy more about mod #1). I also wanted to use some of the techniques I prefer for finishing, like 3 needle cast off for finishing the shoulders and douple pointed needles to make a seemless collar. (Mods #2 & #3). Mod #4 was making the measurements fit with his measurements and the guage. I can’t wait to see what he thinks and see how it looks on him. At 3, I’m not certain of his taste in clothes, but hopefully he’ll like it a bit. The one thing that I did that I really think makes the sweater less dull is that there’s a texture stripe in the middle of the color stripes. I alternated the purple and green, and the single strip in the middle of each pattern is a purl row so that it has a nice texture on the outside, and nothing amiss on the inside to annoy young skin. I also like the way the colors work together. 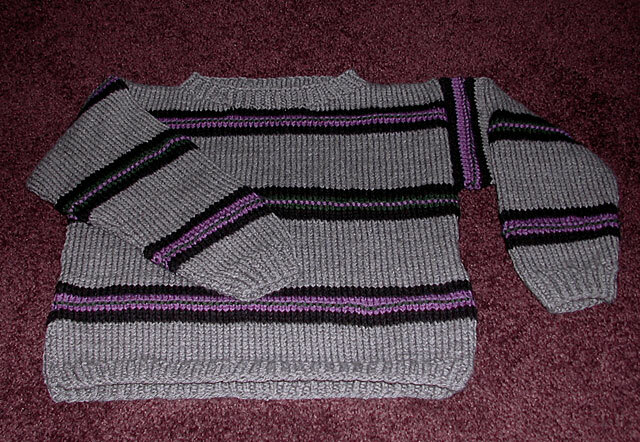 It took a while to decide how the stripes should match up, and I am very pleased with those results as well. 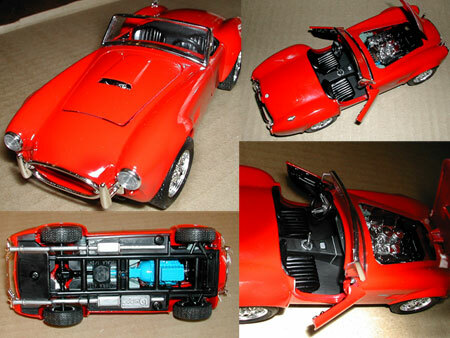 Brian and I got back to working on our models this weekend, and I finally finished the Cobra I’d been working on. Thanksgiving weekend will be a model working weekend with our friends Jen & Craig. I’m still trying to decide what kind of models I like working on best. This is the first one I’ve finished. I have an anniversary edition of the Lunar Lander that I’m working on, a rubber band engine wood frame Spitfire (a $10 I picked up this weekend), and a Polar Lights “The Witch” to work on. I’ve started the Lunar Lander, and it’s turning out really well. I want to do The Witch with an airbrush. Brian and I are currently researching one that will allow us the best variety of uses. We’re leaning towards a Badger 175. So this is the Cobra all finished. It’s a metal body. A very simple model to paint, and a bugger to put together with a lot of little fragile parts. I want to get the VW Bug from this company, it’s so darn cute. And with the airbrush, perhaps I can finally have The Galloping Grape I saw when I was 16 that I wanted so very badly. Clicking on the pictures will usually link to the larger version for easier viewing of details. This entry was posted on Monday, November 20th, 2006 at 12:09 pm	and is filed under Fiber Arts, Other Art, Scale Models. You can follow any responses to this entry through the RSS 2.0 feed. You can leave a response, or trackback from your own site.